Hi beautiful beings! I am doing it! After a long hiatus, I am hosting another lady Body Pride on Friday, September 12th (7-11pm), $50. Body Pride was inspired by Betty Dodson’s Bodysex workshops that she still holds in her New York apartment. 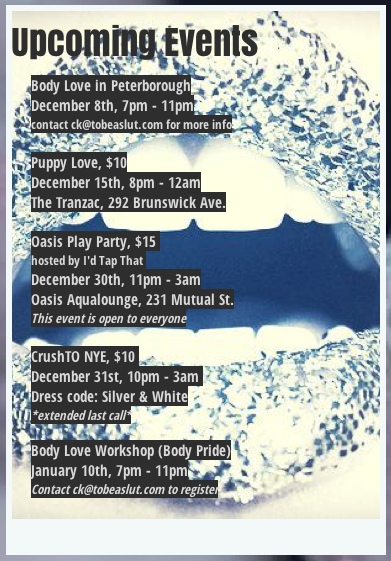 Body Pride is 100% naked, filled with facilitated group conversation about our bodies and sexualities. An evening of wine, (vegan friendly) snacks and a gleefully silly photoshoot to finish it off (totally your call to participate or not). We still have a couple of spaces left! Please send me a message at ck@tobeaslut.com if you’d like to come!